Embryo quality, is an important component in the success of an in vitro fertilization (IVF) procedure. Assigning a grade to an embryo is one way doctors and embryologists identify the best quality embryos for transfer. Embryos are graded, or evaluated, by their appearance under a microscope in the IVF lab. In the days leading up to your embryo transfer, your embryologist will assign a grade to each of your embryos at their various stages of development to determine which ones are the most likely to result in a healthy pregnancy. They are then labeled as good (little to no imperfections), fair (not outstanding quality but not completely imperfect), or poor (having many imperfections). Stage-dependent grading involves evaluating these characteristics at each stage of embryo development. Embryo grading methods differ among IVF labs. How one embryologist goes about grading an embryo may be different from how another does it at another lab. What are the stages of embryo development? Embryos go through several stages of development after fertilization before they can be transferred to your uterus. These stages are marked by cleavage, or cell division. Zygote: The sperm and egg (also known as the reproductive celles or the gametes) unite during reproduction to form a single-cell zygote. Cleavage Stage: Approximately 24 hours after fertilization, the embryo goes through its first cell division (cleavagae) and can have between two and eight blastomeres (cells formed by cleavage). Morula: This occurs approximately 96 hours after fertilization. As blastomeres continue to divide, they begin to adhere tightly to each other in a process called compaction. Early blastocyst: On the fourth day, a small fluid-filled cavity called a blastocoel forms inside the embryo. Blastocyst: The placenta and fetal tissues separate. This is the stage during which the embryo is usually transferred to the uterus in IVF. During natural conception, the blastocyst would normally reach the uterus at the end of the fifth day. Hatching blastocyst: Around the sixth day, the embryo will hatch from its zona pellucida, its protective protein shell. This allows the embryo to implant in the uterus. In some IVF procedures, a technique called assisted hatching is used to help the embryo break out of its shell. In IVF, the early embryo goes through its cleavage stage in an incubator and is generally transferred to your uterus in the blastocyst phase. During natural conception, the embryo goes through its cleavage stages while traveling through the fallopian tube. Fragmentation is a process in which portions of the embryo's cells have broken off. It is preferable to have little or no fragmentation; the more fragmentation seen, the poorer the embryo quality. Sometimes, embryos may look like they have a high number of cells that are the same size and shape—prime qualities for a transfer—but they are not able to implant into the uterus. That is because at least 60 percent of embryos that appear normal are actually not able to implant. Some fertility specialists are creating new techniques to better determine embryo quality. A new technique out of Britain uses time-lapse imaging that takes thousands of snapshots of the developing embryo that could help doctors select the best embryos. Doctors in Texas are hoping to use embryo biomarkers, checmicals secreted into the media in which they are grown, to grade embryos. If you are at risk for passing a genetic disorder to a child, your doctor may recommend pre-implantation genetic diagnosis (PGD). Your lab will perform the procedure about three to four days after fertilization. During PGD, your embryologist removes a single cell from each embryo and screens it for specific genetic disorders. 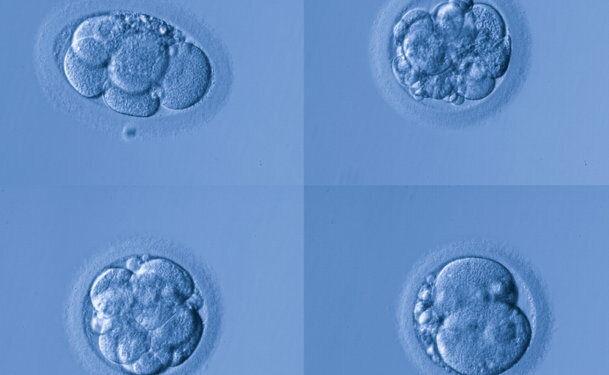 Embryos that have the gene associated with the disease will not be used. While it does not completely eliminate the risk, PGD does decrease the chances of passing a disorder onto a child.